Wisconsin Lakes entered 2016 in a difficult spot. Governor Walker’s 2015 budget veto of the longstanding partnership contract with WDNR led to the elimination of the position of Education Director and a farewell to longtime employee Susan Tesarik, not to mention two-thirds of the organizational budget. But sometimes challenges can bring positive change, and the Wisconsin Lakes that leaves 2016 behind is a leaner, more efficient, more focused organization that is ready to take on the challenges of 2017. And given the past year’s obstacles, the accomplishments of 2016 speak to the stability and strength of Wisconsin Lakes, thanks in large part to the overwhelming support of the lakes community in Wisconsin. Speaking out for strong water policy. In the fall of 2015 through the end of the legislative session in the spring of 2016, legislators launched a boatful of legislation damaging to lake policy. While not able to stop everything, Wisconsin Lakes, along with our conservation partners, helped prevent passage of damaging legislation on groundwater, dredging in lakes by individuals, and threats to Wisconsin’s public trust doctrine protections. In addition, working with Republican and Democrats alike, we were able to gain new liability protections for groups wishing to place habitat structures or navigational hazard buoys in lakes, and pass refinements to lake district law. Lakes in Action. Instrumental in the successes of the 2015-16 legislative session was the active participation of Wisconsin Lakes members, a fact that showed the power of a lake community actively advocating for lake protection. 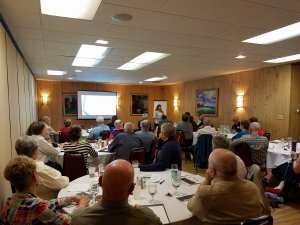 To foster and organize that power, Wisconsin Lakes partnered with the River Alliance of Wisconsin to resurrect our Lakes In Action citizen advocacy program, holding workshops in the fall to teach basic advocacy skills to individuals and lake organizations. Lakes in Action will expand in 2017 with the intent to amplify the voice of the lake community, through additional workshops, and targeted work with regional and countywide groups on local issues. The Wisconsin Lakes Partnership Convention. This annual event in Stevens Point concentrated on our citizen monitors in Wisconsin in 2016, and is co-planned by Wisconsin Lakes and other members of the partnership. In addition, Wisconsin Lakes took over financial management of Convention funds in 2016. The Lake Leaders Institute. Every other year, the Partnership gathers roughly 30 citizens, agency staff, academics, or other government employees for a course on leadership and lakes. In 2016, Crew 11 of Lake Leaders heard seminars and conducted activities on everything from basic limnology to capacity building for lake organizations to the basics of government and policy development in Wisconsin. The Wisconsin Lake Stewardship Awards. Coordinated by Wisconsin Lakes and voted on by representatives from the Partnership, the Lake Stewardship Awards are handed out each year at the Lakes Partnership Convention and celebrate the best among us for efforts to protect and preserve our lake resources. It’s Your Water, Wisconsin. A collaborative effort to illustrate the support of strong water policy by all Wisconsinites and to foster communication between advocates of disparate issues facing water in Wisconsin, Wisconsin Lakes joined with the Central Sands Water Action Coalition and the River Alliance of Wisconsin, creating a website and launching a social media campaign highlighting these issues. Spreading the message – Regional events. Despite losing the dedicated funding from the DNR contract that previously paid for Wisconsin Lakes’ participation in regional events, in 2016 the organization continued its work to keep these important educational workshops and conferences going. Specifically, we continued to serve on planning committees for the Northwest Wisconsin Lakes Conference, the Red Cedar Conference covering the Red Cedar watershed in western Wisconsin, and a workshop of north central countywide lakes and rivers associations. Hundreds of waterfront property owners, government officials, citizens, and others attended and learned about important lake and water issues from polluted runoff to aquatic invasive species to shoreland development and more. Tightening the belt. Losing a significant amount of revenue forces a reconsideration of both expenses and organizational efforts, and Wisconsin Lakes took aggressive steps towards efficiency and cutting costs without sacrificing services in 2016. In addition to the regrettable elimination of the position of Education Director, we limited other expenses as well, including the downsizing of our office by moving into a more affordable shared space that also features better accessibility to lawmakers in downtown Madison. Coupled with the first increase in organizational dues since 2002, we limited the financial damage in 2016, and with a reworked strategic plan Wisconsin Lakes is in a position to fully rebound in 2017. Improving communication. By launching a new website in the fall and committing to a larger social media presence, Wisconsin Lakes modernized and improved its communications offerings in 2016. The upgrades allow for quicker and more efficient delivery of the kind of thorough, informative communications for which we have come to be known. 2016 was a year of successes amid challenges and a good deal of adaptation to a new reality. For even more information, you can check out our 2016 organizational report. But as the season changes and the days grow longer, Wisconsin Lakes is stronger than ever, and ready for what is to come in the new year.